Expert witness providers – which are most active? Are professional experts a “good thing”? If you’re being paid by a party, isn’t there at some level a psychological pressure to say what they want to hear – to slip from objectivity into … advocacy? In fact, it seems the opposite occurs. Repeat players become more neutral. Leading arbitrator Doug Jones AO, speaking at a GAR Live in Dubai, told the audience that, as an arbitrator, he regards professional experts – those who earn a living from it – as a definite plus. He said, having experienced the pressure of a hearing, experts learn the pitfalls of over-reaching; so they give more measured input. “They get to understand that they will be far more effective if they put forward fair propositions,” he explained. Of course, there are outliers – repeat players who seek to take advantage of arbitration’s confidentiality to swap positions between cases – arguing in effect against themselves at a later point in time. But on the whole, repeat experts are a force for good. If an expert forged by hearings is good, then how do you locate one for every sort of expertise you would value? After all, your case may be complicated. Imagine a dispute about a contract to build and operate a gas processing plant. It might require an engineer or construction specialist to opine on whether the build would have run to time and budget; a chemist to predict the quantity of gas it would extract from its inputs; an oil and gas economist to opine how much that gas would be sold for; and finally, a forensic accountant to pull it all together in a set of accounts. How can you ensure that every person you add to the team has the trial-experience you seek? That’s where the expert witness consulting firms – and this report, the expert witness firms part of the GAR 100 – come in. Those firms put mixed disciplines under one roof, making it easy to connect with the right people. And this report substantiates their experience. To create it, we use the same method we use in the GAR 30, for law firms. We take “the hearing” and use that as the lens. We collect information on expert witnesses and hearings from both law firms and expert witness firms and determine a total for hearings per expert firm over the research period (as with the rest of this book the research period is 1 August 2016 to 1 August 2018). We also determine the average and median value of claims for each arbitration. From the data submitted by expert witness firms, we also separate out which expert witness firms are doing the most work in different genres of international arbitration: commercial, investor-state and certain industries, such as oil and gas. Table 1 is the GAR 100 Expert Witness Firms’ Power Index. It’s a smaller version of the GAR 30 – about experts. It shows the (mean) average and the median value of claim sought in arbitration. Alongside this, it shows the total number of hearings accumulated by members of a firm in those two years. These are combined to give a score, which creates the ranking. Table 2 shows the number of experts recognised in our sister publication, Who’s Who Legal: Arbitration 2019. 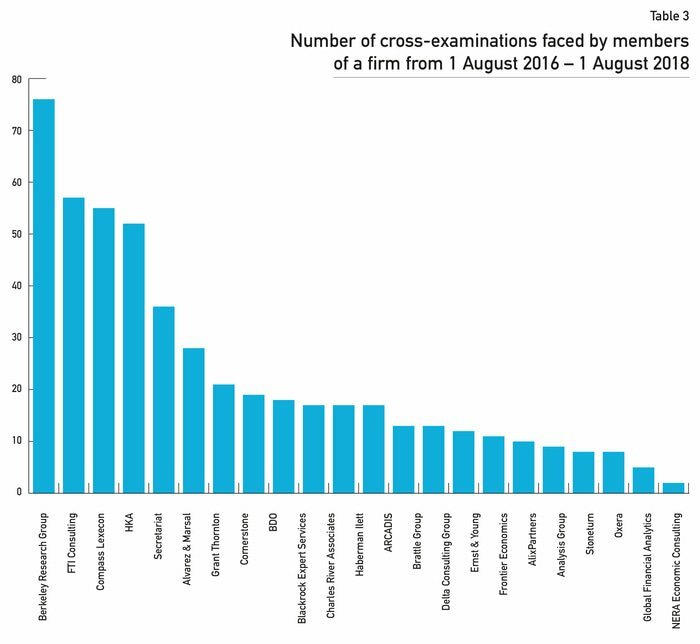 Table 3 shows the number of cross-examinations faced by members of a firm in the same time frame. Table 4 shows the total number of investor-state arbitrations versus commercial arbitrations a firm undertook. Table 5 shows the total number of energy arbitrations and the number of those that were oil and gas. 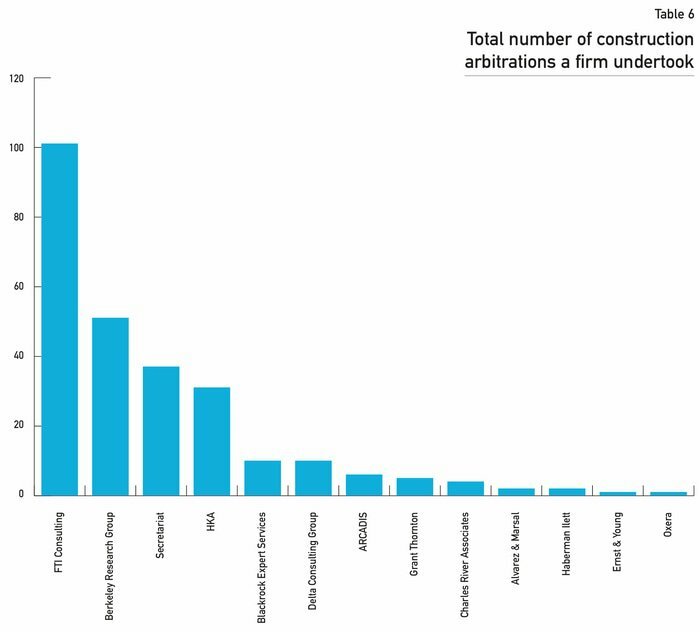 Table 6 shows the total number of construction arbitrations a firm undertook. This year, 20 firms qualified to be ranked. Eagle-eyed readers may have noticed that there are fewer firms in the survey than a year ago. That’s because, this year, we decided a firm must have at least five mentions by GAR 100 law firms (in their responses about hearings) to earn consideration. Table 1 uses data supplied by law firms (as part of our annual GAR 100 project). This data is therefore third-party validated. Some other tables – chiefly tables 3 through 6 – use data supplied by the expert witness firms themselves. In table 2, we use our sister publication, Who’s Who Legal: Arbitration 2019 as a proxy for market recognition enjoyed by a team. As always, it is important to recognise the project’s limitations. Most notably, when it comes to the Power Index, if a large case an expert firm has worked on was handled by a firm not on our radar for the GAR 100, then we won’t have it logged. These figures we present are not everything an expert firm has worked on; it is everything the firm has worked on for firms in the 100 or applying to join. There is a difference. Nevertheless, the tables offer an insight into who is doing what. Want to know which expert witness firm is most active in construction arbitrations? Go to table 6. Want to see which firms are weighted towards investor-state arbitrations? Go to table 4. Want to see if there is a correlation between number of recognised individuals and activity? Go to table 2. Want to know who has the best blend of quality (value of cases) and quantity? For that, we produce the Power Index. The Power Index sorts the expert witness consulting firms into an order based on volume and value of work. This is the fourth year we have surveyed these firms, but only the second year we’ve included the Power Index, so it may be premature to speak of trends. Still, what stands out? The top five features most of the same names as last year – but in a new order. Compass Lexecon is still at number one – although with scores that, measured against last year’s edition, are a little down. Its average value of claims is lower by US$553 million and its experts appeared in 49 hearings, as opposed to 52 in 2018. Its median value of claims is half what it was. That may be in part because more of the Compass Lexecon hearings were commercial cases this edition; in 2018 the balance was towards investor-state. But there is a new firm at number two. FTI Consulting (parent to Compass Lexecon) moves up one place to overtake Haberman Ilett. Haberman Ilett hasn’t particularly changed. Comparing its performance to last year’s both its average and median scores are higher (the average by US$7 million higher than last year, and its median value by US$67 million). The firm is much sought after for its expertise in oil and gas markets, so although it’s not a big shop (compared with some), everything it does seems to be of huge potential value. FTI Consulting, however, has improved against itself in 2018. In particular, it scored 27 more hearings than a year ago (when it was already the busiest practice in the index). Although its average and median value of claim slightly decreased when compared with a year ago, this volume increase pushed it up the table. It’s hard to tell what produced this “extra” – but a lot of FTI work is construction-focused, and at the ICC. As well as working on construction matters with GAR 100 firms, it appeared on energy, and oil and gas and infrastructure matters and some investor-state cases, and a couple of matters connected to Greek and Cypriot financial services. Frontier Economics, the highest climber in this year’s Index, also improved against its figures a year ago. Its average value of claims rose from US$176 million to US$299 million; while its median value is over five times larger. Originally founded to advise on European energy policy in the 1980s and popular in antitrust circles, the firm has started to attract instructions in both investor-state and commercial arbitrations. Its overall number of hearings however remains reasonably small. KPMG rounds out this section of the table. Last year it was the only member of the Big Four to crack the top 10, in 6th. This year it climbs one better – to 5th. It posted the highest number of hearings of any firm in the Big Four – 60, compared with 39 at the next nearest member PwC. A handful of those claims involved John Ellison being appointed, who has since joined FTI Consulting. Blackrock Expert Services is a new entrant. The Brattle Group’s fall is partly because it posted lower figures than a year ago. Both its median and average value were down, from US$443 million to US$166 million, and from US$3.2 billion to US$1.3 billion respectively. More of the firm’s hearings were in the range of US$100million than previously (it was also slightly down on number of hearings at 27 this year, compared with 33 last year). The changes are relatively minor, however, and it was evident from the data that the firm continues to be selected frequently for billion-dollar matters. Otherwise, the firms in this section all improved on themselves a year ago. Secretariat International’s average value of claim rose US$50 million on 2018’s, and it also posted four more hearings (12 rather than eight in 2018). Those included two multibillion-dollar commercial claims, one construction and one nuclear power-related (the firm is known for both construction and for energy work). Charles River Associates, meanwhile, saw its median value of claims jump from US$88million last time to US$230 million and its hearings rise from seven to 11. These changes reflect, in part, greater success attracting investor-state arbitrations (the firm also poached a member of Berkeley Research Group – Simon Ede, a consultant to companies in global energy markets). Oxera doubled its number of hearings recorded a year ago, from three to six and held fairly steady on average claim value (US$433 million this time compared with US$454 million). The firm was founded originally by Oxford academics who specialised in energy and regulated industries. But its largest cases now also span mining and construction, as well as investor-state work. Most of the cases we logged featured Min Shi. No year-on-year comparison is possible with Blackrock Expert Services, as it’s a new entrant. Founded in 2009, in London, it has only recently sought a name in international arbitration, although its focus has long been construction. It posted 12 hearings and an average and median value to those of US$136 million and US$202 million. The cases weren’t exclusively construction. The firm also featured in energy and telecoms disputes. David Barry – a member of the firm – was Who’s Who Legal’s Construction Expert Witness of the Year 2018. Table 2 tracks the number of highly regarded individuals working at the surveyed practices, according to our sister publication Who’s Who Legal). We include the data on hearings from the Power Index chart there too. Until now, we have been drawing on information extracted from law firms about expert witnesses. But what does the picture look like, using the expert’s own self certified information? Here we look at the response to the question: how often were your experts cross examined? The results are presented in table three, as simple totals unlinked to any value of claim. many firms are self-certifying far more cross-examinations than is obvious from the Power Index data. Berkeley Research Group’s very different position in this table to the Power Index is testament to the breadth of the international arbitration work universe. The firm was mentioned for nine hearings in the law firm dataset to which their experts had been appointed, and yet the self-certified data shows it has worked on many, many more, but for firms outside the 100. All in all the firm may have taken part in up to 76 hearings (it may be that on occasion multiple cross-examinations took place within one hearing). We return to Berkeley Research Group in the table on energy and oil and gas hearings, below. FTI Consulting and Compass Lexecon’s positions are consistent with their Power Index positions, although their self-certified numbers are lower than those gleaned from law firms. HKA Consulting, formerly Hill International, falls from second to fourth place but increased its number with 52 cross-examinations this year, compared with 51 last year. While the firm worked on several investor-state matters, in addition to its more usual diet of construction-related matters, its average value didn’t life much beyond previous years – it was around US$300 million – holding it back in the Power Index. Secretariat International, in fifth place, totalled 36 cross examinations, again a far higher number than was gleaned from the GAR 100 law firms (by 24). Founded in 2008 by Don Harvey, the firm has a name in construction and engineering circles, especially in the US, and its work reflects that: all of its cross exanimations were in construction matters. Alvarez & Marsal, in sixth place, also posted higher self-certified numbers (28 hearings versus 14 mentions in the GAR 100 law firm data, although it is possible some of those matters saw multiple cross examinations). The majority of its claims were commercial, and Alexander Demuth, Laura Hardin and Luke Steadman all took the stand multiple times. Grant Thornton, in seventh, identified 21 cross-examinations. The majority of their experts’ cross-examinations were on quantum and damages – Colin Johnson testified on these issues in energy and infrastructure matters, while Vidya Rajarao was examined on hydropower, and oil and gas, Hisham Farouk on hydro power and agricultural trade. 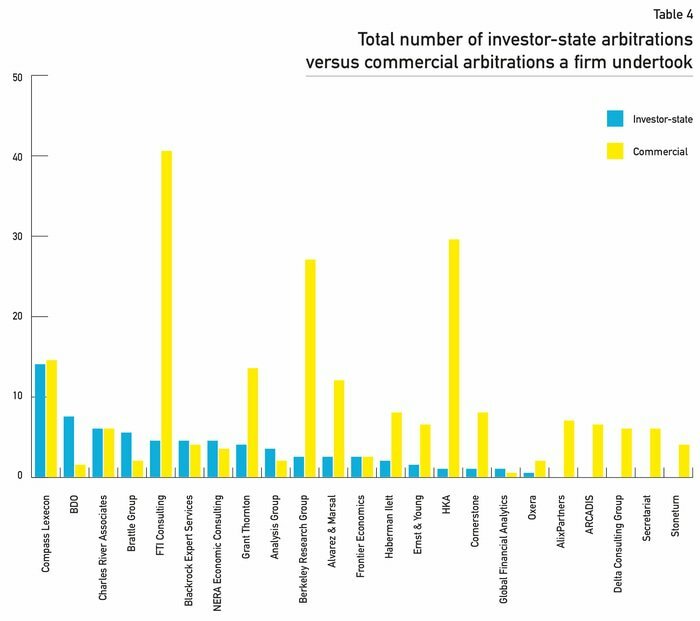 Table 4 shows the split between investor-state and commercial arbitration within firms in the survey – and therefore also which practice has had the greatest docket of investor-state work. Compass Lexecon has the highest total of 28 investor-state matters, and an almost even balance with commercial work (29 matters). One of Compass Lexecon’s largest investor-state claims was ConocoPhillips v PDVSA, which finally concluded last year with a US$2 billion award for the energy company against Venezuela’s state-run oil company. BDO Consulting posted the second-highest total for investor-state matters – 15 (and three commercial). The renowned Gervase MacGregor is responsible for the work on many of those matters. FTI Consulting has the greatest weighting to commercial work, on the other hand – with work concluded on 81 commercial cases to only nine investor-state. Around one quarter of its cases were ICC , with a substantial amount in construction. AlixPartners, Arcadis and StoneTurn are the only firms in the survey that worked solely on commercial arbitrations, in our research period. AlixPartners has a strong mixture of insurance, life sciences and healthcare, financial services, and oil and gas matters. Arcadis, a construction-focused firm, saw appointments in infrastructure, oil and gas, water, buildings and roads, offshore breakwater and port clearance. StoneTurn’s were in the defence and power industries. In this table, we focus on the number of energy-related hearings per practice, and within those the number of oil and gas-related ones. 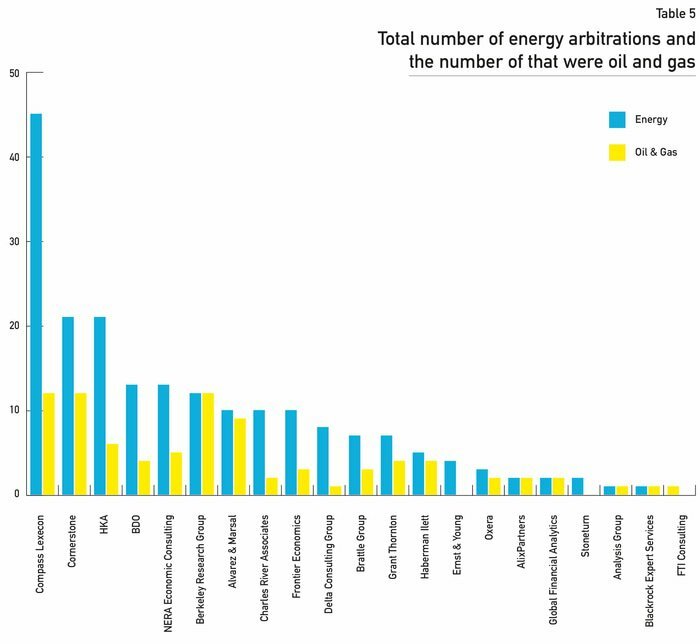 Compass Lexecon leads on number of energy arbitrations with 44, of which 12 are oil and gas. Subject matters include damages, pricing of LNG, and regulation of renewables. Pablo Spiller, Boaz Moselle and Manuel Abdala led this work for the most part. The firm’s cases have included both ICC and ICSID cases for commercial parties and states, each with claims of several billion dollars. 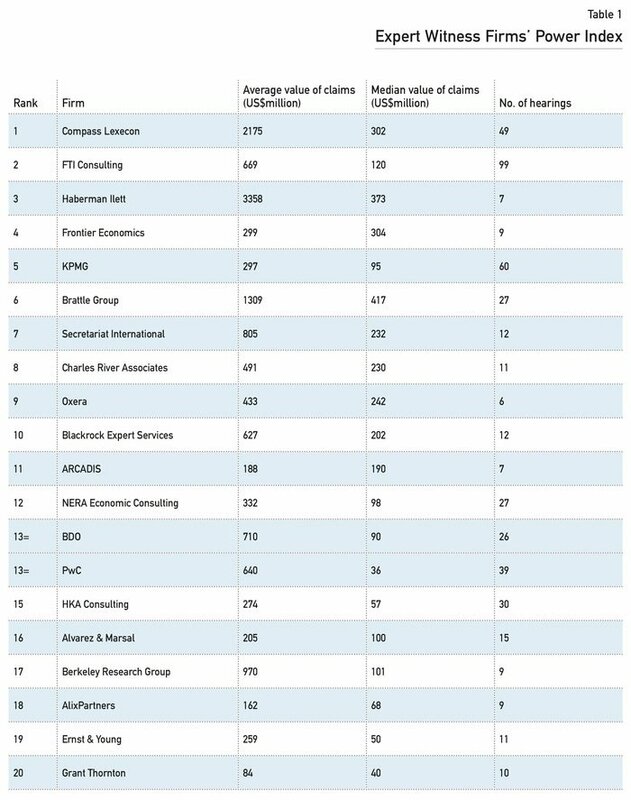 Cornerstone and HKA Consulting are second equal, with 21 energy arbitration hearings each. Cornerstone had 12 oil and gas matters, while HKA had six. Although Cornerstone didn’t feature often enough in the GAR 100 law firm research to make this year’s Power Index, it did work on a natural gas claim of over US$20 billion. With the exception of two appointments, Cornerstone’s matters were all commercial arbitrations, many LNG and gas pricing matters. Many of HKA’s appointments were construction disputes related to energy projects, either on quantum or delay – or both. BDO and NERA Economic Consulting both worked on 13 energy matters. BDO had four oil and gas matters. NERA had five. The majority of BDO’s oil and gas appointments were ICSID cases. NERA’s oil and gas matters were a mix of investor-state and commercial. It was also appointed on renewable matters, including hydro-electric disputes. BDO also saw appointments on valuation in hydro-electric. Gervase MacGregor, Eduardo Pérez and David Mitchell led these cases most often for BDO; at NERA it was Fabrizio Hernández and Richard Hern. Berkeley Research Group’s 12 energy cases were all oil and gas. As well as working under the mainstream arbitration rules, its experts took part in cases heard under Nigerian arbitration rules and in various sub-Saharan Africa disputes. Christopher Goncalves and Gardner Walkup tended to lead on those occasions. Although the hearing took place before our research window, it emerged last year that Berkeley Research Group had provided the four experts who helped an oil and gas investor win one of the largest commercial awards on record against Nigeria. Andrew Caldwell, Simon Ede, Anthony Melling and Bradley Wolf testified on behalf of Process & Industrial Developments (P&ID) which in 2018 asked the US to enforce a US$9 billion win against Nigeria’s ministry of Petroleum Resources over a failed gas-refining project. Table 6 strips out the work related to construction disputes. FTI Consulting leads it with 101 construction hearings; Berkeley Research Group is second on 51; Secretariat International third on 37; and HKA Consulting fourth on 31. Strikingly, the overall number of construction matters recorded by this table is up significantly on last year – to 261 from 135, from around the same total number of firms (13). One explanation is that FTI, which didn’t supply any self-reported data last year, is one of those firms. But many of the other firms in the table are also up: BRG’s number last year was 3; Secretariat’s was 29; and HKA’s was 37. 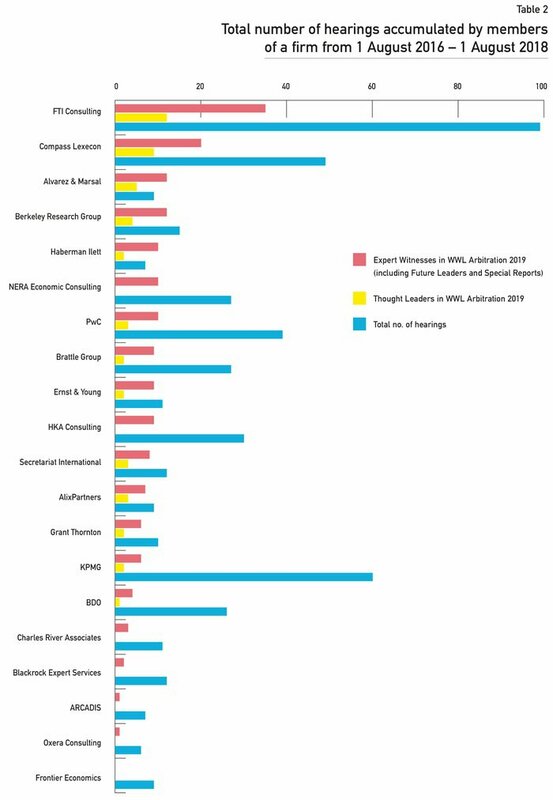 Of the top tranche only HKA totalled fewer construction arbitrations than a year ago. A couple of firms didn’t appear often enough in the GAR 100 law firm data to qualify for the Power Index, but still deserve a mention. Analysis Group, based in Boston, stood out as a name that is starting to appear. The firm – and in particular John C Jarosz – was mentioned by several GAR 100 firms. As well as working on disputes about telecoms, purchase agreements and healthcare, the firm was part of a team that recently won a €500 million investor-state award relating to Greek sovereign debt. Cornerstone Research is home to Ronnie Barnes, José Alberro and Matthew Lynde who are all well-known experts in international arbitration. Ronnie Barnes has provided written and oral testimony on numerous matters and has acted as expert on cases related to the banking and chemical industries. José Alberro is sought after in energy disputes (the firm is third in the energy-specific table), and Matthew Lynde in San Francisco is head of the intellectual property practice. He has testified on over 65 occasions. Delta Consulting Group is another name that’s started to appear more in the law firm part of the research. It was founded in 2000 by Jeffrey Fuchs and Dakus Gunn, both of whom were mentioned for matters by GAR 100 firms. They and the firm enjoy a name for construction work. Global Financial Analytics and its founding partner Richard E Walck appeared several times in the law firm research on US oil & gas and maritime claims. StoneTurn – and in particular Jonny Frank and Neil Ashton – also cropped up often enough to deserve some attention. Among other things, members of the firm appeared on significant commercial arbitrations arising from defence contracts. A leading global provider of expert witness, dispute resolution and consulting services within the construction and technology sectors. Since its formation in 2009, Blackrock Expert Services has grown to over 100 full time professionals, located across offices in London, Preston, Paris and Dubai. In April 2017 the company was awarded the prestigious Queens Award for Enterprise in International Trade for its outstanding growth in overseas sales in the previous three years. Most recently the acquisition of IT Group UK has expanded the range of expert witness and consultancy services Blackrock Expert Services provides to IT expert services, digital forensics and e-Disclosure. Blackrock Expert Services has worked on an extensive range of projects in 60 countries. These projects include some of the most iconic and ground-breaking developments in the world such as The Shard, Blackfriars Bridge, Heathrow Airport and the East London Line. Blackrock Expert Services’ team of over 25 specialist Experts have been appointed expert over 500 times collectively, accumulating over 500 hours on the stand. Several are recommended in Who’s Who Legal guides, including Arbitration, Construction, Consulting Experts, Thought Leaders; and the company’s founder David Barry was named Construction Expert Witness of the Year 2018 at this year’s Who’s Who Legal Awards. Blackrock Expert Services’ professionals come from a variety of educational and cultural backgrounds, speaking 17 different languages and counting. This combined with the company’s varied international project experience allows Blackrock Expert Services to deliver a breadth of service and quality whilst immediately reflecting the nuances of working with different nationalities, with different cultures and in different jurisdictions.